Food assistance provided by the Supplemental Nutrition Assistance Program (SNAP) — known as CalFresh in California — significantly reduces the rate and severity of poverty throughout the state. 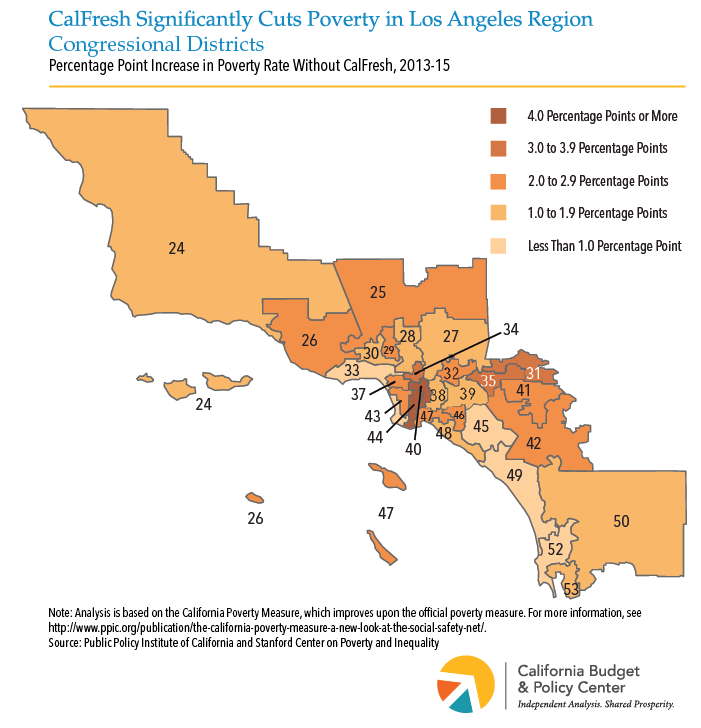 Without CalFresh, the poverty rate would have been higher in every California congressional district from 2013 to 2015, according to updated California Poverty Measure data recently produced by the Public Policy Institute of California and the Stanford Center on Poverty and Inequality. 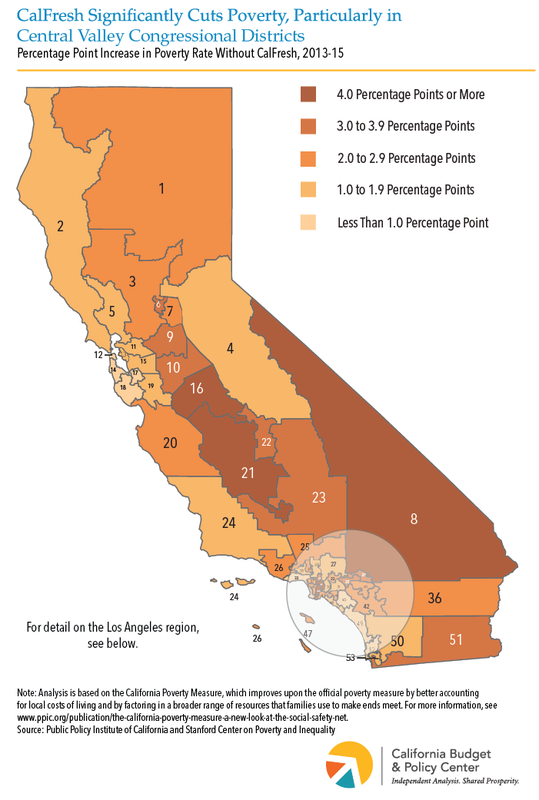 During this period, CalFresh reduced the poverty rate by 2.3 percentage points statewide, with the largest reductions — up to 5.4 percentage points — in districts in the Central Valley (see maps below.) 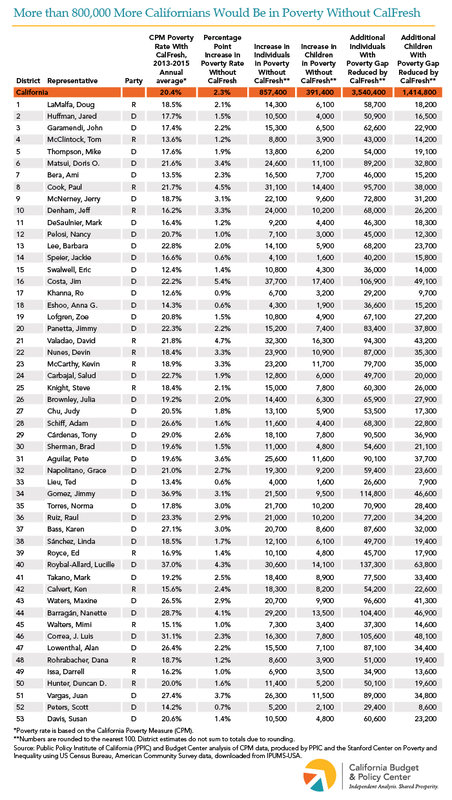 More than 30,000 people per year would have been in poverty without CalFresh in Districts 16 (D-Costa), 21 (R-Valadao), 8 (R-Cook), and 40 (D-Roybal-Allard). Food assistance through CalFresh also lessened the severity of poverty for 3.5 million more people per year across California by reducing their poverty gap, or the shortfall between a family’s level of resources and the poverty threshold. Congress will soon need to reauthorize the Farm Bill, which sets eligibility and funding levels for SNAP, but both President Trump and some congressional leaders have proposed cutting federal support and limiting who is eligible. Cuts like these would greatly reduce the effectiveness of one of California’s most important tools to mitigate poverty.